REPRINTED FROM "WHEELS OF THE BRAVEST"
During the final days of the Civil War, a movement to replace New York City's volunteer firefighters with a paid department was started by the insurance companies because they felt New York's ordinary fire loss was too heavy. This movement soon gained two powerful allies: the Metropolitan Police Department, because too many fire alarms resulted in inter company riots, and the State Republican Party who saw a chance to deprive the City Democrats of a valuable political weapon-the volunteer firefighters. On March 17th, 1864 the Board of Fire Underwriters appointed a committee of officials from insurance companies underwriting fire insurance in New York City to "promote the greater efficiency of the Fire Department." The Metropolitan Police Department supplied quite a bit of evidence to this committee against the volunteers. There were many affidavits from police captains describing the "rioting, pilfering, public annoyance and sabbath desecration" caused by the volunteers. Republicans agreed to sponsor a bill in the State Legislature to create a paid department. A survey of paid departments operating in other cities was undertaken. This committee study and conclusions resulted in charges that the volunteer system was more expensive and less efficient than a paid department would be; that the Chief Engineer was deprived of control of the volunteer department's finances (by a Democratically controlled City Hall) and that there was too much political involvement in the volunteer department. There was a quick attempt by City Hall and the Volunteer Department to reorganize the department and correct some of the abuses, but it came much too late. On January 16th, 1865 a bill was introduced in the State Legislature entitled "An Act to Create a Metropolitan Fire District" which included the establishment of the so衏alled Metropolitan Fire District, a Board of Fire Commissioners (appointed by the governor), and a paid department. In effect, City Democrats would lose all control over the Fire Department and, more importantly, its finances, thereby also suffering a heavy political loss. The bill passed on March 30th, 1865. The vote was 21�in the Senate and 81 �9 in the Assembly. It was quickly signed by the Governor. The Act provided for the City of New York (at that time consisting only of Manhattan) and the Eastern and Western Districts of Brooklyn to be united to form the Metropolitan Fire District of the State of New York and the creation of a Board of Fire Commissioners (four citizens of this new district) to be appointed by the governor who would create the new paid Metropolitan Fire Department and have exclusive authority to extinguish fires within the new district. Also included in the act was a requirement that the volunteers turn over all their property, apparatus and firehouses to the new department. Selection of members of the new department was to be from the volunteers as much as possible. Brooklyn was included so that the constitutionality of the Act would not be objected to. The first Board of Fire Commissioners' meeting was held on May 4th and on the following day they were served with two court orders which had been obtained by the volunteers forbidding the commissioners from taking charge of any Volunteer Fire Department property and ordering them to show by what authority they held their office. A relatively short court battle followed. While awaiting the court's decision, the new Commissioners began recruiting (with preference to the volunteers), drew up a budget and started organizing the new department. On June 22nd, the Court of Appeals in Albany declared the "Act to Create a Metropolitan Fire District" constitutional. The new Commissioners immediately took posession of all Volunteer Fire Department property. The volunteer companies in the meantime were to continue in operation until the paid companies were established. On June 24th, the new department established its Headquarters at 155 Mereer Street Metropolitan Engine 1, the first paid unit in New York City entered service with this new Amoskeagsteamerwhich had been delivered to the volunteer department shortly before the paid department took over. "Metropolitan Steam Fire Engine Company 1" the first paid company, was established on July 31st at 4 Centre Street equipped with a new Amoskeag 1st size double vertical pump round tank steamer. Between September 1st and December 1st, 33 additional engine companies and twelve ladder companies were added to the new Metropolitan Fire Department. In addition, 5 "Suburban Engines" and 3 "Suburban Ladders" were organized. All of these units were established in former volunteer firehouses. The "suburban" companies operated differently than the regular "full time" paid units. Hoseman and ladderman in the suburban units were paid less than their counterparts in the regular units but they were permitted to work at their former occupations. They had to conform to all other rules and regulations of the new department, were required to sleep in the firehouse, attend all alarms, and be present in quarters two afternoons per month for drills and committee work. The suburban engine companies were equipped with hand drawn pumpers and the suburban ladder companies were equipped with ladder trucks similar to the regular ladder companies except that they were hand drawn. The volunteers had turned over to the new Metropolitan Fire Department 32 steamers, 36 fuel tenders, 25 hand pumpers, 49 hose carriages, and 18 ladder trucks all of which were hand drawn. The volunteer department consisted of 52 engine companies, 54 hose companies, and 17 ladder companies. The transition period from volunteer to paid was not a smooth one, overshadowed by both personal and political opposition. There were many instances of the new department being blocked from responding, having hose slashed, apparatus damaged, and members insulted and physically abused. Often, volunteer hose companies refused to lay lines from the steamers of the paid department. The Metropolitan Fire Department replaced these 123 volunteer units by the end of 1865 with 34 engine companies and 12 ladder companies establishing full paid fire protection up to 87th Street. North of that point, then the "suburbs", the 5 Suburban Engines and 3 Suburban Ladders provided fire protection. On organizing, the MFD policy was to equip each Engine Company with a horse drawn steamer and a one horse hose tender. In order to accomplish this, the MFD Repair Yard, which was established at 21 Elizabeth Street with 34 mechanics, immediately set about converting 29 of the 32 steamers that the volunteers had turned over, to horse drawn (the remaining 3 steamers were converted a few years later). The other five engines were equipped with hand drawn hand pumpers in lieu of steamers as were the suburban engines. The former volunteer steamers that were converted by the shops included an 1859 2nd size James Smith, two 1859 2nd size Lee and Lamed, an 1860 2nd size Amoskeag, an 1860 2nd size Silsby, an 1861 2nd size Silsby, an 1861 2nd size Portland, an 1861 3rd size Portland, an 1861 2nd size Amoskeag, an 1861 3rd size Amoskeag, an 1862 2nd size James Smith, two 1862 3rd size James Smith, an 1862 3rd size A.B. Taylor, an 1863 2nd size Joseph Banks, two 1863 3rd size Joseph Banks, an 1863 2nd size Jeffers, three 1863 3rd size James Smith, an 1864 3rd size James Smith, an 1864 3rd size Joseph Banks and two 1864 Van Ness. The size of the steamer was determined by its gallon per minute pumping capacity as follows: Extra First Size 1100 1300 gpm, First Size 900-1000 gpm, Second Size 700-800 8pm, Third Size 500-600 8pm, Fourth Size 300-500 8pm, Fifth Size 250-300 gpm. Thirty-four new hose tenders were delivered by Amoskeag in 1865 with one being assigned to each engine thus eliminating the separate hose companies of the volunteers. These hose tenders were of the 1 horse 2 wheel hose reel type, each carrying 16 lengths of rubber 21/2" hose. There was a box on the rear of the tenders which carried a supply of fuel for the steamer thereby eliminating the separate fuel wagons used by the volunteers. This type of hose tender provided for a quick stretch and rapid reloading. A hand brake controlled the speed of rotation ofthe reel when stretching hose while a side handle was used to rewind. The only riding position for men on these tenders was for the driver. Engine Company manpower consisted of two officers, an engineer, driver, stoker and seven firefighters. A typical ladder truck of the early department, it carried only ground ladders and equipment and did not have room for the firefighters to nde. The 12 ladder companies of the MFD were equipped with "standard" type "hook and ladder" trucks which were also turned over by volunteers and converted to be horse drawn in the repair yard. They carried ground ladders up to 73' in length which reached the roofs of most buildings of the time (aerial ladders were not yet invented). Two officers, a driver, tillerman and eight firefighters were assigned to each ladder company. The company commander was required to maintain not less than 9 men in quarters at all times and a minimum of 11 after evening meal leaves were finished. These manpower requirements reflected the amount of men needed to raise the long heavy ladders of that period. 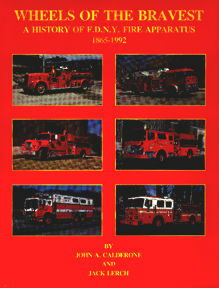 Former Volunteer ladder trucks that were placed in service with the paid department were a W.H. Van Ness of unknown year, an 1856 Pine and Hartshorn, an 1856 John H. Sickles which had been rebuilt in 1862 by James P. Conk, an 1859 C.E. Hartshorn, two 1859 William Williams, an 1860 C.E. Hartshorn, an 1861 William Williams, three 1862 C.E. Hartshorns, an 1863 C.E. Hartshorn and two 1865 C.E. Hartshorns. In addition to the 34 new hose tenders, 7 new steamers were purchased in 1865 from the Amoskeag Locomotive Works in Manchester, New Hampshire. These included three 1 st Size double vertical pump round tanks and four 2nd Size single vertical pump tanks. These steamers replaced some of the volunteer steamers and hand pumpers which were then either reassigned to other engines or used as spares. As the city expanded and the need for waterfront fire protection became apparent, the Board of Fire Commissioners contracted with the owners of the steam salvage tug "John Fuller" to operate as a fireboat on a "call basis" for a yearly fee. The "Fuller" was equipped with two Amoskeag steam pumps of 2000 GPM capacity and was capable of throwing thirteen streams of water. The boat was stationed at a West Street dock in the Hudson River and when required, the dispatcher would transmit a special call signal over the department telegraph system to the quarters of Engine 27 who would then send one man to the boat with the necessary information. New apparatus for the year consisted of five 1st size barrel tank frame Amoskeag steamers, eight 2nd size "U" tank frame Amoskeag steamers and one 2nd size double straight frame Amoskeag steamer. Two new ladder trucks were also received. The first one was built by Charles E. Hartshorn while the second one was manufactured by Francis Young. These were basically the same as the former volunteer ladder trucks still being used by the MFD. In addition, each of the ladder company firehouses were assigned a "jumper". These were two wheel hand drawn carts with hose reels and eight lengths of hose. This allowed the ladder companies to start putting water on the fire when they arrived on the scene before the engine companies. They were known as "jumpers" because they were easily maneuvered and able to be "jumped" over curbs and other street obstructions. Two 2 wheel hose tenders were placed in service during 1866. The first was built in the Repair Yard while the second was purchased from Amoskeag. These were of the one horse hose reel type. The "part-time" system utilized in the suburban companies was found to be ineffective. As the city expanded north, it was recognized that fully paid units would be needed, so, on December 28th, all of the suburban engines and ladders were disbanded and four new engines and three new ladders were established. While the Board of Fire Commissioners concerned themselves with organizing, equipping and expanding the MFD in New York, the City of Brooklyn, which was also covered by the "Act to Create a Metropolitan Fire District", was ignored. The residents and city leaders of Brooklyn were unsatisfied with this situation and attempted to have the state legislature amend the Metropolitan Fire District Act to allow Brooklyn to organize its own paid fire department. They were unsuccessful at this time. As the MFD expanded, its need for steamers outgrew their availability. Four new engines had been organized and there were still three engines running with hand pumpers. Three steamers that were in service with engines were rebuilt at the Repair Yard. Those were an 1860 Amoskeag, an 1863 Smith and an 1859 Lee & Lamed. A fourth steamer, that had not yet been placed in service by the MFD, was rebuilt by Amoskeag. This one was an 1865 R.M. Clapp 3rd size horizontal frame steamer which was turned over by the volunteers in 1865. Amoskeag rebuilt it, installing a new boiler and generally up-grading the steamer. Five new 2nd size Amoskeag straight frame steamers were also placed in service. Four new Amoskeag two wheel hose tenders were also purchased to equip the new engines. A new ladder truck was purchased from C.E. Hartshorn in addition to rebuilding two 1862 C.E. Hartshorn, one 1859 William Williams and the Van Ness ladder trucks. Two gooseneck ladder trucks, both built prior to 1865, were upgraded and placed in service with Engine 38 and Ladder 15. The assignment of a ladder to Engine 38 made it the first "Combination Engine Company" which meant that in addition to its steamer and hose tender, it also ran with a ladder truck with extra manpower to perform truck work. These combination companies were generally in areas remote from ladder companies and where the type of construction and life hazard in the area did not call for a full time truck company. The repair yard also built three hose tenders. All of the available spares were kept in the Repair Yard at this time. There were eight steamers, three hose tenders and two ladder trucks which were designated alphabetically to indicate that they were spares. The Rules and Regulations of the MFD at the time stated that a maximum of three men were permitted to ride on the steamers, only two on the hose tenders and only the driver and tillerman on the ladder trucks. Everyone else, including the chiefs, ran alongside the apparatus when responding to alarms. This situation seems to have been a holdover from the traditions of the volunteer department. None of the volunteer rigs were horse drawn and everyone was needed to pull the apparatus hence there were no riding positions on the rigs turned over to the MFD. When these apparatus were converted to horse drawn at the Repair Yard, there was no prior reason to have riding positions added for the men because the men never rode on the apparatus before. Realizing that their men, now responding to more alarms than the volunteers ever did, were arriving at the scene physically exhausted, the Commissioners directed the chief in charge of the Shops to devise a method for the men to ride to fres rather than run. After some trial and error, the Repair Yard began installing "running boards" on the side of the ladder trucks so that the men could ride the apparatus to alarms. It is interesting to note that the term "running boards" was used instead of "side step" or some other term as the boards were used in place of running. This was a major innovation in fire apparatus design at the time and lasted unchanged for almost a century until bucket seats were added on cab forward aerial ladder tractors and eventually the completely enclosed four door crew cabs provided seating for all members removing everyone from the "running boards". However, the running boards themselves survive on newly designed tillered apparatus to this day. Solving the riding problem on the ladders, the Shops turned its attention to the engine companies. This was a much more difficult problem. While the ladder trucks were upgraded with little difficulty, there was no practical way to have any more men ride on the steamers. The answer to this problem was to totally redesign the hose tender. An "improved" hose tender was constructed by modifying an existing hose tender, placing four seats topside and a step for two or three men across the rear. Five of these rigs were built at the Repair Yard by upgrading 1865 Amoskeag hose tenders and 6 new ones were constructed while Amoskeag provided 11 new hose tenders of the "improved" design. The rear step which had been placed on these tenders eliminated the fuel box which necessitated establishing separate fuel wagons as the volunteers had used. There were eventually 36 fuel tenders throughout the city before the steamers were phased out. Four of these were regularly assigned to respond on multiple alarms while the others were fully loaded in various firehouses. The assignment cards designated engines that had responded to the fire who were responsible to provide fuel supply. After arrival at the fire, the hose tender driver of these engines would unhitch his team and proceed to the firehouse where the fuel tender was kept and return to the fire with it. On June 18th, while Engine 1 was operating at a fire on the Bowery, and explosion occurred in the boiler of the 1865 Amoskeag steamer which killed seven persons and injured many others. There were charges of incompetency in maintaining safe operating pressures and as a result, Engine 1 was disbanded. Six new steamers were placed in service, four 2nd size straight frame Amoskeags, one 3rd size crane neck frame Gould and one 2nd size Allerton. The Repair Yard also rebuilt an 1861 Amoskeag 2nd size, an 1863 James Smith 3rd size, and an 1859 Lee and Lamed 2nd size steamer as wellasan 1862andan 1865 C.E.Hartshornladdertrucks,an 1856 Pine and Hartshorn ladder truck and the 1866 Young ladder truck. Three new ladder trucks were built in the Repair Yard and placed in service during the year..
Due to the poor condition of the unpaved roads north of 86th Street, it was necessary to provide heavier apparatus in ~this area. Six, two horse, four wheel hose tenders were purchased for this purpose. All other hose tenders in service up to this point were of the one horse, two wheel style. Two new fuel wagons were also purchased. A decision was made to gradually eliminate all first size steamers. It was determined that they were too heavy and cumbersome to be drawn by one team of horses, especially during the winter months. Within four years, this decision would be reversed. At the beginning of 1869, three Brigades and eight Battalions were formed. The first organized training program was established and a Manual of Instructions for Officers was issued. The shops rebuilt another former Volunteer steamer that had not yet been placed in service, an 1865 Amoskeag. Having decided that first size steamers were not suited for service in New York City, four second size Allerton steamers were purchased commencing the replacement of the first size steamers. It was recommended to put the first size steamers into reserve and locate them at strategic locations such as the repair yard, selected firehouses and fuel depots in the event that their services would be required. Thirty-one hose tenders were rebuilt and one Allerton 2 wheel hose tender was purchased. The Repair Yard also built two new ladder trucks. During the early years of the paid department, it was common practice for the Shops to build new apparatus. Three new fuel wagons were placed in service during 1869 bringing the total of fuel wagons in operation to ten. By the end of the year, all but four of the original volunteer steamers had been replaced by new steamers. While the Metropolitan Fire Department developed at a steady pace, events were occurring on the other side of the East River that would greatly reshape the new department in the future. On May 5th, a law was passed known as an "Act to Reorganize the Fire Department of the City of Brooklyn" which allowed Brooklyn to establish its own paid fire department.. The Brooklyn Board of Fire Commissioners started planningthe replacement of the volunteers. Representatives were sent to New York to observe the operations of the Metropolitan Fire Department. As a result, most of the rules, regulations, procedures, specifications for uniforms and for apparatus ofthe Metropolitan Fire Departmentwere adopted by the Brooklyn Fire Department. One major exception was apparatus color. Brooklyn apparatus was painted a two-tone green to distinguish them from the red apparatus of the Metropolitan Fire Department..
Brooklyn's changeover from volunteer to paid units occurred on September 15th and was not piecemeal as in New York. On that date, fifty-three volunteer units were replaced by nineteen paid units; thirteen engines and six ladders. Six District Chiefs were also organized. Brooklyn, at this time, consisted of only a small portion of what it is today, (the Downtown Area, South Brooklyn, Brooklyn Heights, a portion of Williamsburg, and the area around the Navy Yard.). In preparation for this changeover, Brooklyn's Shops, which had been established at Saint Edwards and Boliver Street, began converting former volunteer apparatus for use by the new paid units. Sets of single and two-horse harnesses were borrowed from the Metropolitan Fire Department and duplicated by Brooklyn harness makers. The Brooklyn Volunteers turned over eighteen steamers, four hand pumpers, twenty-three hose tenders and nine ladder trucks. Thirteen of these steamers were altered by Amoskeag. Included among these were two 1861 second size Amoskeags, an 1867 third size Amoskeag, an 1868 second size Amoskeag, an 1868 first size Amoskeag, an 1869 second size Amoskeag, an 1869 first size Amoskeag, four 1864 Smiths, an 1859 Silsby, and a steamer of unknown year built by Novelty Works. Thirteen new two wheel Amoskeag hose tenders were purchased and six of the ladder trucks were rebuilt.. Unlike New York, Brooklyn was more prepared to institute a paid professional fire service. The transition period was much smoother because all of the volunteers were replaced on the same date, not allowing for any conflicts developing between volunteer and paid forces at the same fire as had happened in New York. The Metropolitan Fire Department continued to be the object of politics. On April 5th, the "Tweed Charter" was passed in Albany. The Tweed Charter abolished all state control over New York City. Among other provisions, it wiped out the Metropolitan Fire District, established a new Boardof Fire Commissioners and the Metropolitan Fire Department became the "Fire Department ofthe City of New York". This act, indirectly, was responsible for the "F.D.N.Y." logo on apparatus instead of "N.Y.F.D.". Most departments place the city or town initials prior to "F.D." but as a direct carry over of the provision to create the "Fire Department of the City of New York", "F.D." was placed before "N.Y." on the apparatus, a tradition which lasts today. On May 21st, the new Board of Fire Commissioners ordered the removal of "MFD" from all apparatus to be replaced by "F.D.N.Y. "..